The disciplinary watchdog of Xiamen, Southeast China's Fujian Province vowed to crack down on Party members who believe in ghosts and supernatural beings instead of Marxism-Leninism. The city's 70,000 Party members have been checked whether they have participated in superstitious activities. Xiamen's discipline inspection authority urged Party members to rectify problems detected by inspections, according to the website of Communist Party of China (CPC) Central Commission for Discipline Inspection (CCDI) on Saturday. The content of the self-inspection includes membership in religious organizations, cults or superstitious groups, attendance at religious ceremonies and the use of fortune tellers, according to a notice of Xiamen's discipline inspection authority in August 2018 posted on the website of Xiamen University Tan Kah Kee College. The city authority has talked to officials involved in 20 cases for violating the Party's political discipline, the CCDI said. 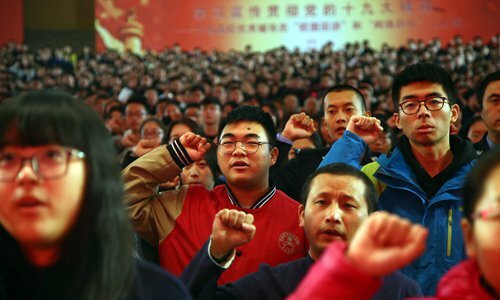 Every Party member in Xiamen recited the Party oath, and was required to sign a letter of commitment to be firm Marxist atheists, and to obey the Party rules and stick to the Party's faith, an official of the Bureau of Ethnic and Religious Affairs of Xiamen who requested anonymity told Global Times on Sunday. The Xiamen discipline inspection authority held 31 training courses for 2,630 Party members in 2018, the CCDI said. The revised regulations on CPC disciplinary action published in 2018 by the CPC Central Committee said that Party members who believe in religions should be educated, and would be urged to withdraw from the Party if the education fails to correct them.